The ELK-110 Voice "Talking" Driver features high quality digitally pre-recorded voice messages and loud attention getting siren sounds in an economical, low current draw, compact package. 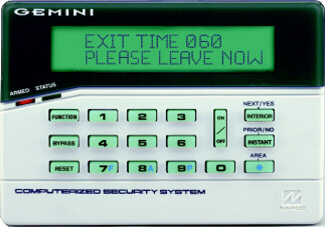 It features two input channels, bilingual voices (English and Spanish), and many unique options which allow it to be used with virtually any residential or commercial alarm installation. The voice messages and the siren alternately sound whenever one of the channels are activated. The ELK-110 may be customized by use of on-board jumpers. 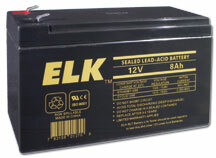 For example: the MilliMiser™ option allows the already low current draw of the ELK-110 to be reduced even lower. 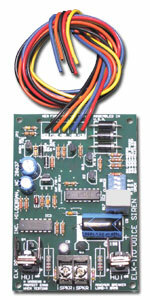 This is ideal for controls with limited alarm output power. The ComboTrigger™ option allows controls which have a single alarm output and pulsing option to activate both the burglar and fire alarm sounds. The VolumeStep™ option is best described as the "peacekeeper", since it causes the siren sound to start at low volume, gradually increasing over 90 seconds to maximum volume.